Ocean Breeze East, the affordable condo directly on the gulf, is perfect for those who enjoy small complexes. The building has 31 units with a Gulf front swimming pool and a large sun deck. 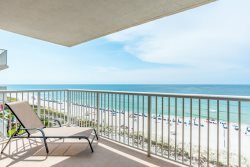 This condo has 980 SF of living area and Gulf Front balcony access from the Living Room and Master Bedroom. Carpet throughout Living, Dining and Bedrooms with Ceramic Tile in Foyer, Kitchen and Baths. Electronics include 46" LCD TV, DVD in Living Room, 32" LCD TV in Master Bedroom and 32" TV in Guest Bedroom. The Perdido Realty Team was great to work with, if I had questions they were answered quickly and professionally. My family enjoyed our stay at the property and would certainly stay there again. Perdido Realty is a great place to rent your vacation place from! The staff was very helpful and friendly. I had a small issue before arriving and they helped me in a timely and efficient manner. I have stayed in this condo and another in the same complex on numerous occasions and will be returning again. I love the building and location. I always have a relaxed and fun vacation when I stay there. Wonderful view. The dcor was very nice. Had everything we needed- thanks for the Keurig! I didn't want to leave and hope to come back soon. I have worked with several rental groups in the past year, and I must say that Perdido Key Realty was one of the most accommodating and efficient that I have had the pleasure of doing business with. The web site is informative and user-friendly, and the overall experience was lovely. The unit in which I stayed appears to have been recently re-furbished, and it was beautifull, comfortable and accommodating! If I had a complaint at all, it would be about the noise during the night from the people in the unit above me. .
Everyone I dealt with at Perdido Realty was extremely nice and very helpful! This was our 3rd year at the same condo. We love it. Everyone is so nice and the location and size of condo is perfect. We had a fabulous time and enjoyed our stay! Awesome Condo, and we had a great great time! Would love to return.